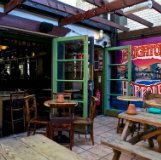 The Hop Poles is a Brighton institution known for its intimate atmosphere, quirky outdoor terrace and fabulous ever-changing menu that is both incredibly tasty and creative. Solid pine tables, walls adorned with retro magazine covers, urban art and beer mats and lampshades your granny would be proud of, the Hop Poles manages to perfectly blend the traditional with the kooky and get it spot on. Only a few hops from the beach or the city centre, this unique little pub with a big personality also boasts a new sound system. It’s perfect for laid back lunch hours or as a upbeat night time destination.